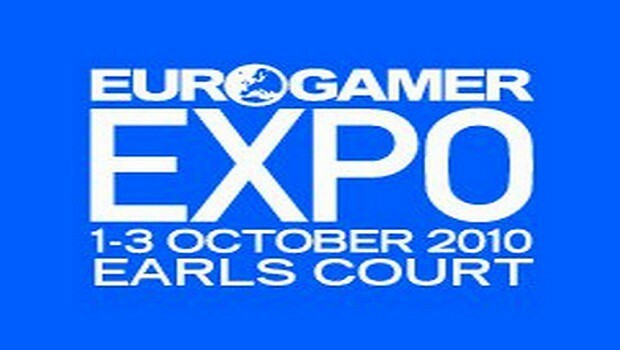 This is the third in a set of four daily reports which will cover the games I played last weekend at the Eurogamer Expo 2010 in London. Today's all-action trio of bullet-stravaganzas comprises Killzone 3, shown in full 3D, SOCOM 4 with the PlayStation Move, and the multiplayer mode of Crysis 2. Click on the links to read my Expo reports on Legend of Zelda: Skyward Sword, Assasin's Creed Brotherhood and Microsoft Kinect, and Kirby's Epic Yarn, Vanquish and Enslaved: Odyssey To The West. Enjoy! In the 'Over-18' zone of the Eurogamer Expo, the area of predominant interest to an audience of rotund adolescent boys whose evident pride in gaining access to an exclusive area was perhaps the strongest of many arguments as to why they should never be allowed in one again, Killzone 3 took pride of place beside both entrances. This, along with the curiosity value of its 3D presentation, acted as a magnet to the louder (in volume and dress) and more odious members of a crowd already of mixed hygienic value. Think that sounds snobby? You're probably right. But then I joined the throng about halfway through the day, hoping that there would be time to wade through the extensive lines leading up to both this and Zelda. When you have at least a hundred teenagers bellowing at each other from close proximity and the overpowering scent of unwashed underwear and armpits thickening the air, it would be a challenging ask of any self-respecting lifeform not to harbour a smidgen of disdain. Not least since I remember the days when that might have been me in full obnoxious voice. Playing the game, it's no surprise that it attracted the audience it did. It's loud and busy, desperately lacking in any depth or nuance but seeking to make up for it with a host of under-developed gimmicks and oversized weaponry fizzing with power, but bereft of personality. Killzone 3 is Teenage Boys: The Videogame. In fairness, for the many players out there who prefer a so-called 'cinematic experience' (ack!) over mastering intricate gameplay skills, it will provide a serviceable second choice to Halo when the prospect of sorting out the wires behind the TV to plug in the 360 doesn't appeal. Although lacking the Bungie series' balance and carefully orchestrated stage-management, it has plenty of high powered weapons to shoot strange looking aliens with. For the first minute or so, a message was plastered across the top of the screen that this was a Pre-Alpha build. Hopefully that will go for the 3D too, which was by turn distracting and disorienting. On a 2D screen, having a gun hovering beside you blends into the background without much fuss. With it emphasized in a third dimension, the artificiality suddenly becomes glaringly prominent. Any benefits which may have come from the addition of visual depth (and frankly, the demo's single style of play didn't suggest any in particular) were lost among environments and objects that always seemed marginally out of place. Anyone who saw Clash of the Titans in 3D will know how damaging the effect can be when done badly. Killzone 3 wasn't a disaster on that scale, but there was an offputting sense of displacement and discord between objects and their surroundings. Fingers crossed that these will be ironed out by release, but the game didn't bode well as many players' first exposure to the technology. On their own terms, the visuals otherwise looked pretty good on a standard HD screen. 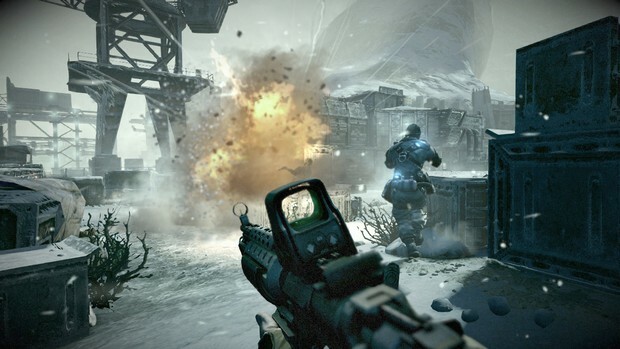 Previous entries in the Killzone series have embraced colour marginally more than most of its grey-and-brown hued brethren, and presented the Expo with an assault on a Helghast Arctic compound of crashed tankers and rigs enveloped by ice floes and a crashing ocean in the midst of a fierce snowstorm. The demo was structured as a succession of small gunfights, throwing between five and ten enemies for the player to mow down (the AI, it must be noted even in this early form, was spectacularly poor and quite content to run into your line of fire while facing in the opposite direction) before progressing to the next. It started with an on-rails shooting section from a helicopter and ended as one of your allies hoisted you to higher ground, cutting off with no attempt to provide any sense of closure. But then, that's what I got the feeling the Killzone experience will be all about. Brutish and underdeveloped, but knowing what its audience wants and pandering to them without taking the risk of trying anything new. Is that bad? Not necessarily. But on a day when it was one of a huge number of better games clamouring for attention, its headline technical trick fell short and despite that macho exterior, didn't have enough else under the hood to keep up with the pack. All three of today's games suffered from varying degrees of technical troubles, with SOCOM 4 exhibiting some primitive texturing and a jarring model swap after a bus was blown to smithereens. There was also a crash bug which had to be worked around once the demo needed to reload following completion, but the stand reps were helpful in giving directions through the circuitous alternate route to getting the game started. Nevertheless, where Killzone 3 died by its inability to present anything else of interest other than its failed 3D, SOCOM 4's demo was built on sufficiently sturdy foundations that its signs of early development were easy to ignore thanks to a gameplay experience that was focused, a steady framerate and superb controls: the demo was played using both the PlayStation Move and a Dual Shock. I've been vocal in my belief that dual analogue sticks feel ridiculously imprecise and archaic compared to the quick precision of pointer aiming and while that sentiment remains true, SOCOM's stick aiming was the most perfectly pitched I played with all day and didn't take nearly as long to get used to as any of the many other shooting games, whose sensitivity alternated between too slow or frustratingly twitchy. That said, playing the game with Move was nevertheless vastly more friendly and enjoyable. There weren't any noticeable advantages over playing a shooter on the Wii with its remote, although the enhanced precision put it instantly level with the Motion Plus assisted Red Steel 2, currently the gold standard for aiming fluidity on Nintendo's console. The glowing orange ball at the end of the stick was distracting though, and the Wii remote's rectangular shape feels more satisfying to wield as a gun than the cylindrical Move. But these issues are nominal: for everyone who has been waiting on the opportunity to play a shooter combining the Wii's superior control system with the graphical prowess of an HD system, SOCOM 4 is shaping up to be that game. As for the demo, it mainly took place around a destroyed motorway swarming with heavily-armed enemy troops. Since I was pressed for time, I skipped the cut-scenes and therefore cannot provide much detail on the intricacies of the revealed story. Like Killzone, the level involved moving between a series of small-scale fights, although with a greater emphasis on taking cover and giving squad-mates instructions to provide assistance in vanquishing your assailants. The AI for both allies and enemies was solid, not showing any great strategic planning but playing out the situation intelligently and responding to commands as intelligently as could be hoped for. Even with the game being generous with its health, there were two situations when I misjudged an advance and only managed to avoid death by sending my squad forward to cover as I retreated into cover. Enemies mostly ran to the nearest object and concealed themselves behind it, ducking out to fire a few shots or run away should a grenade be sent their way or excessive damage done to their hiding place. There were few signs of tactical thinking, other than spreading out across the battlefield as widely as possible, but no reactions stood out as particularly unrealistic either. Once past the narrow confines of the ruined motorway, there was a long-range attack on an enemy encampment that put focus on the down-sights aiming, while the appearance of a tank and subsequent authorisation of an air strike emphasized the importance of timing your attacks correctly, with the tank having to be 'tagged' for several seconds before the attack could be called in. The demo's final act opened the battlefield up onto a broad marketplace where enemies hid behind stalls and bus stops, with the fighting becoming more frantic and encouraging quick movement between cover so your position couldn't be pinned down. Although the basic structure of the level was similar to that of Killzone 3 � small gunfight, move forward, rinse, repeat � the small differences between each scenario brought out different facets of the gameplay and gave a more effective demonstration of the depths the game had to offer. Unlike Killzone, SOCOM's demo was both an excellent demonstration of a new technology, which all PS3 shooter fans should quickly adopt as standard, in addition to being an intelligently designed and enthralling experience in its own right. It's high irony that the sequel to a game most famous for its technical achievements should suffer the most grievous faults of any game on show at the Expo. By my own and a handful of other accounts, Crysis 2 was a mess and should probably not have been on the show floor at all. During my ten minutes with the game's multiplayer, I had regular pop-up, a highly unpredictable framerate and mixed visual quality. During conversations about the game with fellow players, two stated that the game had crashed on them mid-match. When a game's reputation is so firmly staked on its pushing the limits of technical excellence, why EA chose to show the public such a shoddy demo is difficult to comprehend. Even in graphical terms, the game was languishing well behind several of its show floor companions - even Killzone 3's declared PRE-ALPHA BUILD put up a good fight. The selected map, consisting of the upper floors and garden roof of a damaged skyscraper, had its highlights for sure (an impressively detailed New York skyline extending in all directions hinted at the scope of the city-based single-player mode), but many of these were more artistic than technical: a broken skylight gushing water and foliage through the roof of an exercise hall, with a trashed art-deco lobby and offices filling the floors below. The original Crysis crafted a number of memorably idiosyncratic images, most famously the frozen jungle, so it's a pleasure to see that Crytek's artists have once again put in a productive shift to bolster any graphical achievements the game hopes to achieve, despite still having a long way to go. 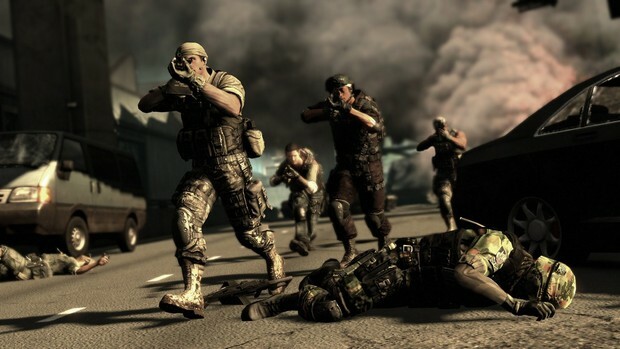 Gameplay-wise, the overall feel was near-identical to that of Modern Warfare, but with the addition of a few player enhancements. The extended jump and ability to turn invisible could bring some interesting tactical variations when used correctly, but didn't seem to make a great deal of difference to the people I was playing (and losing) against. The main difference I noticed was that the penalty in accuracy for not using Iron-Sights aiming seemed to be enormous, posing major problems for anyone who, like me, finds hip-firing more natural. After getting roughly used to the dual analogue system (this was my first FPS at the Expo, and I hadn't used sticks in an FPS for almost two years), I was able to keep my reticule hovering over my intended target fairly constantly, yet even from close range bullets rarely seemed to hit their target. If that sounds like sour grapes, I played a lot of games very badly at the Expo while greatly enjoying them (Assassin's Creed Brotherhood for one), so would like to think that the humiliating final score didn't impact on my overall impressions. 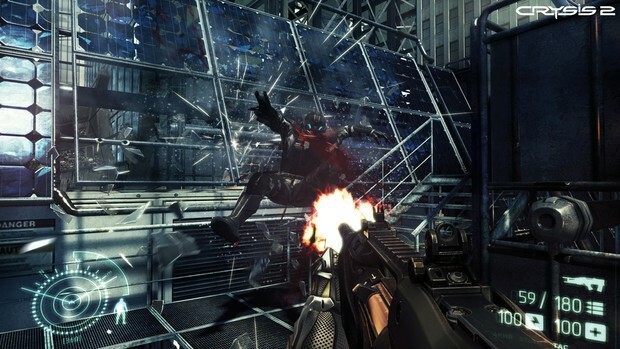 From my time playing, Crysis 2 would appear to be yet another serviceable FPS with a deficit of new ideas and in its early form, severely lacking the polish needed to hide them. Given the number of bugs present in the Expo build, the main question hanging over its head will continue to be why EA chose to show it at all. Thanks for reading! Tomorrow's final trio of games will take in Gears of War 3, Donkey Kong Country Returns and GoldenEye 007.